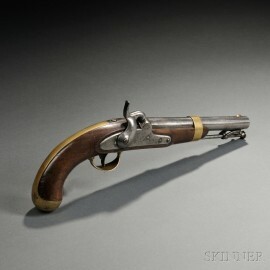 U.S. Model 1842 Percussion Pistol, c. 1846, walnut stock with two cartouche marks on the left side, brass fittings, lock plate marked US/H.ASTON, with the tail of the plate marked MIDDTN/CONN/1846, barrel lg. 8 1/2, overall lg. 14 1/2 in. Missing a small sliver of wood near the left side of the breech, two hairline cracks on grip, steel parts are bright but have some light patina in areas.